A Sunny day for our sail to Baiona, the home of the Pinta (Columbus’ famed boat) where he returned after discovering the New World. Now I have mentioned good holding at the anchorage at Combarro, well after 3 days our anchor was well and truly stuck. We had to drive over it to break it out and it came up with a huge lump of clay/mud attached. With hardly a breath of wind we motored down the Ria, seeing all the things we had missed on the way in. The paper mill at Marin, nice beaches on both sides, the holiday resort at Sanxenxo. Out of the Ria the wind arrived so we started to sail. 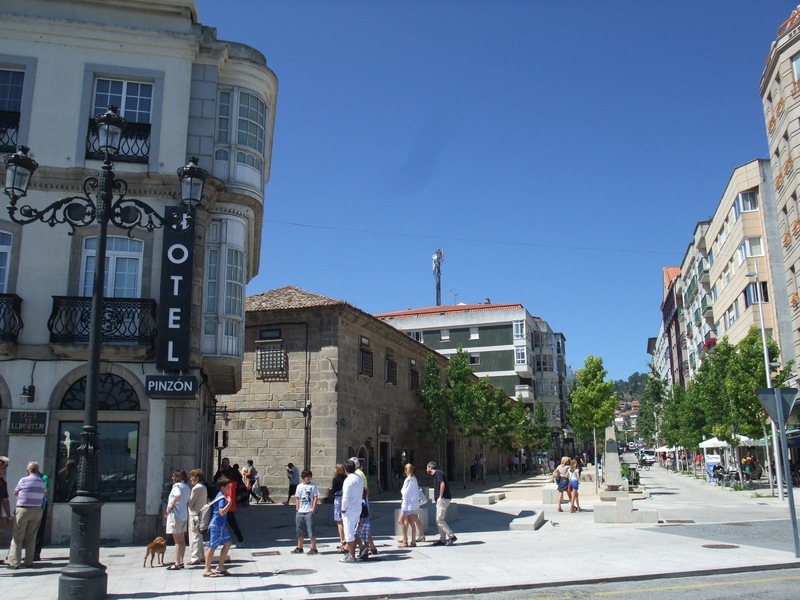 The plan is straight to Baiona. On browsing the pilot book there looked to be a nice marina at Cangas (with a washing machine), so we changed our plans and went there. We had a brisk sail in a F4/5 all the way, sailing between the mainland and the Ile de Norte, dropping our sails close to the entrance to the harbour. 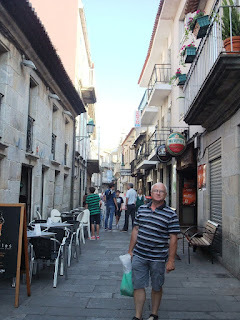 We motored in only to be told they were full and we should try Baiona! So much for changing our plans. As we had not had lunch and it was now 1400, we anchored off the beach which should have been sheltered from the North but was still very windy and decided to spend the afternoon and the night there. 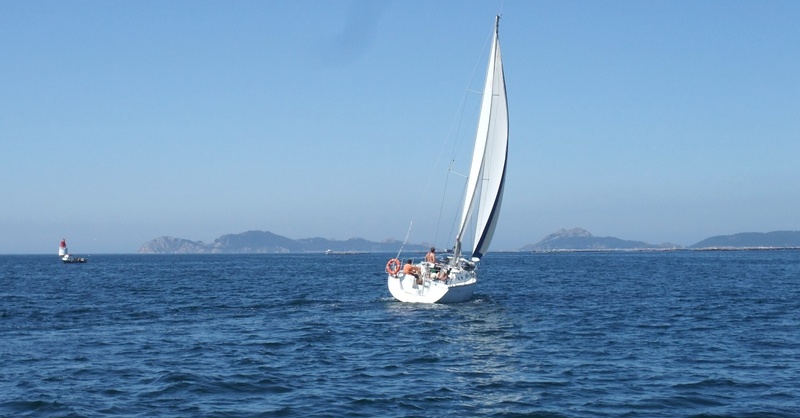 We could sail to Baiona tomorrow in search of a washing machine. The beach was very busy with a handball tournament in progress, many people on the beach but not many in the water. Later we discovered why! Burrr, bloody cold! We had been advised that the Puerto Deportivo Marina was the place to go. We saw the fuel dock and decided to get some diesel. The office was closed (siesta time) we could have fuel but needed the correct cash. The office opened in 20 mins but we couldn’t wait at the fuel dock we would have to move to the visitors pontoon. We moved off to the long visitors pontoon, we could always get fuel in a can later. On checking into the marina we discovered that there was no washing machine and pretty poor Wi-Fi too. We would have to go offsite for both. We found the lavanderia but as they wanted €15 for 5kg, washed and dried but not ironed, they did not get our custom. 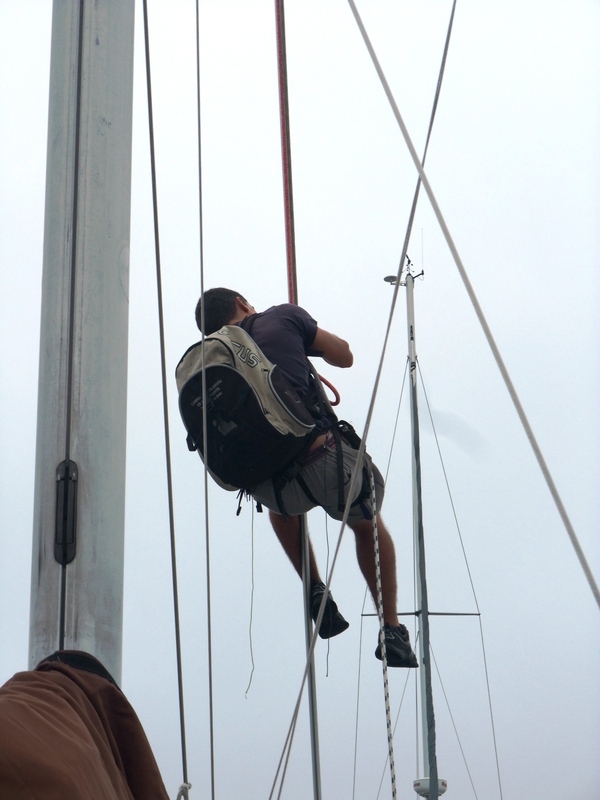 The upside was that there was a rigger available to repair the forestay that was coming apart. This has been a problem for over a week now and so far attempts to repair it have proved unsuccessful. What had happened is that the screws holding the three sections of the foil together had fallen out, allowing the sections to slide apart and twist slightly when the sail was rolled away. With the rigger up the forestay holding a pair of molegrips and me holding the bottom section with another pair of grips we managed to undo the twist, all that was needed now was some new screws. Easier said than done as the old screws were an imperial thread and in Spain they only have metric threads! A little engineering later and everything was fixed. Many thanks Ismael! The next repair was to fix our electric autopilot that was working erratically. Often course changes wouldn’t be seen, a bit of a concern! At other times we would wander off course for no reason. The permanent solution was to get the new tiller pilot working with the Hydrovane, for which we needed a suitable piece of tubing. Luckily the handle from an old bilge pump was just the right diameter and could be cut to fit. A few holes later and a wooden bracket for the tillerpilot to sit on and we were done. Our old Autopilot unit was consigned to the skip. As the wind was forecast to be from the south west and there was the likelyhood of fog for the next few days sea trials would have to wait. When we eventually tried it it worked perfectly! 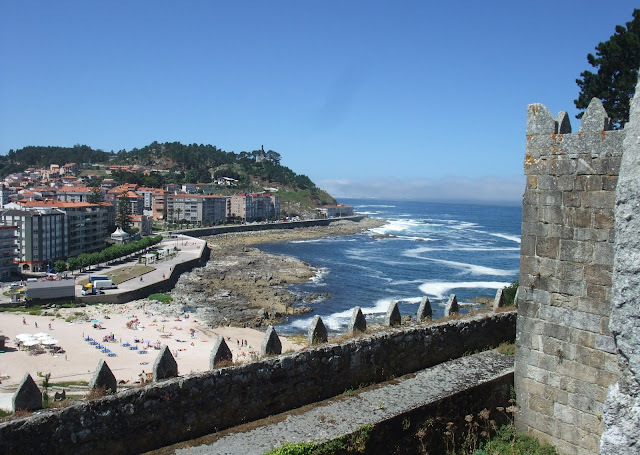 We stayed in Baiona until Friday, when the swell eventually dropped to only (?) 2 – 2.5 m, but it was no hardship. Another lovely old stone town, but the front has mostly been redone at least on the ground floor. The front is full of the usual holiday sort of shops like ice cream parlours, swimming costumes and cafes which cater for all the locals on the lovely beaches. One street back and you are in the old town with narrow streets, some shops and lots of bars and taperias. There are old churches one C12th and other very old public buildings, many C16th. Definitely the place to go to mix with the locals and soak up the atmosphere. We had a few nice beers and lovely food –pimientos de pardon, chorizo infrerno, moules, calamari – sometimes in the company of crew from other boats in the marina. We had to visit the “Pinta” of course, but a bit of a disappointment. It looks good from the pier, but its very poorly maintained and the few props they have here and there are rather comical. The poor helmsman has his feet firmly nailed to the deck. Colombus has lost his big toe. The two Indians down below must be frozen in their loincloths, but I expect the two cockatoos help keep them warm. A much better attraction was the castle. The walls were begun in the C9th and are still all standing, but also enclose a Roman well and cistern. We had a scenic walk along their 3km length with views of the town and then out to sea. 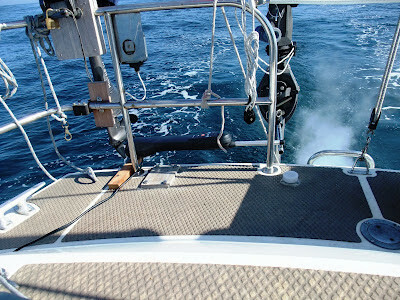 We could see all the breaking waves on the reefs and were glad to be on shore. Fridays weather looked good for a passage south, so Portugal here we come! We are watching your adventure and what a fantastic adventure you are having. Love the details and the pictures.